Don’t know about you but I am tempted to think this Banksy prank was lame. Let me explain! 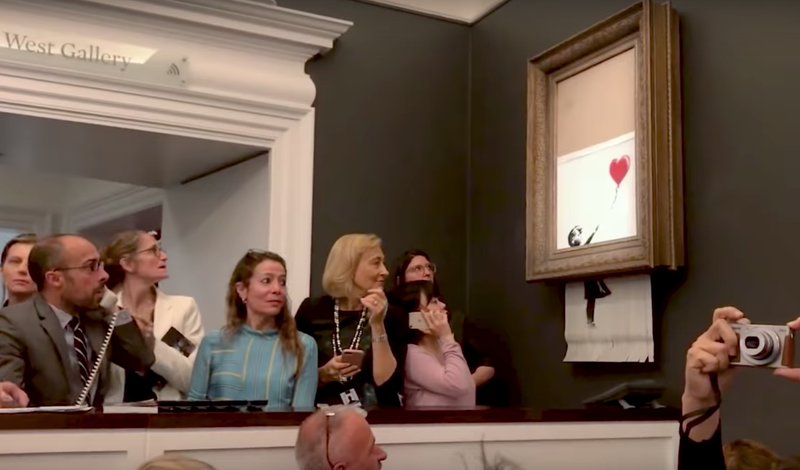 First we hear that the Banksy painting, “Girl With Balloon,” which self-shredded just after being sold at auction earlier this month for $1.4 million, had doubled in value only hours later, thus adding even more perceived worth to the vapid industry in which it will circulate all its days. Moving on, now Banksy says, in a video posted to the anonymous artist’s YouTube channel, that the painting didn’t even shred as much as the artist intended (it stopped about halfway through) due to a malfunction. But the stunt went perfectly in rehearsals!